All children love stories. Parents and teachers love them too because they connect us to the wisdom and beauty found in all cultures and peoples of the earth. 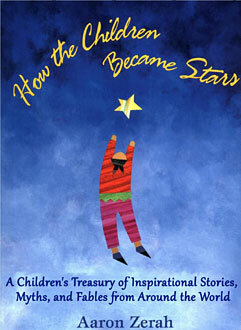 How the Children Became Stars is a gift of fifty-two of our most time-tested and often-told stories, myths, and fables for today's children to learn from and enjoy. In this book, they'll discover a whole world of inspiration — from the Aboriginal Australian hero who chased a kangaroo and discovered the sunrise to the Zoroastrian “Noah” who helped save all living things from a most terrible winter of extinction. Confident queens and kings, battling bullies and peacemakers, masterful teachers and students, and all kinds of animals — greedy monkeys, magic fish, terrible lions, beautiful butterflies, and laughable donkeys — come to life as well in these extraordinary traditional tales. In addition to these entertaining and educational stories, How the Children Became Stars also provides a Sharing Activities section in each chapter that allows children to explore the themes, lessons, and meanings of the stories in relation to their own lives. They'll draw or paint, talk and write about the characters and their own experience, and share a lot of fun along the way! And one more important note: How the Children Became Stars is designed to be shared with children of all ages — from the very youngest to early teenagers — in either a home or school setting. By listening, reading, and participating, everyone becomes a brilliant star!